It sounds like a marketing strategy to say that we have changed over from a system using sulphates and parabens to a gentle cleansing range of ecoproducts. But there is more to it than that. Through the power of odors we really have changed. It all started way back when a customer asked me how I was reducing my carbon footprint. I knew her well so I held up my scissors in horror and told her the truth: hairdressers work with chemicals and formulas to restructure the look and feel of hair. And in doing so they’re not saving the planet! We had already installed an efficient two part boiler for saving energy, but this got me thinking about changing to a more sustainable range of products. I started looking around at what was on the market. For us, chemical products had always been packaged as reliable formulas that would do what it said on the tin. That tin was finally recycled when I found the new range of Keune So Pure. It was a relief to find gentle natural formulas that could make hair shinier; give natural volume, and maintain colour. What I didn’t know at that stage was the positive effect that the new products’ would have on our team during the working day, as well as our customers. To give you some early examples: a customer was gazing in the mirror at the shelves of mint green bottles behind me and she said “they make me want to go out and buy Creme de Menthe!” The comment probably relates to her seniority in years and made me laugh because I knew exactly what she meant. Another customer remarked that she would like to buy the same smell as the one she had at the basin, meaning the So Pure Exfoliating Shampoo with extracts of lavender and tea tree. We sometimes feel like we’re selling exotic food, like red pomegranates or brown star anise because we talk about food a lot, and somehow using these products reinforces that lovely feeling. The experience of a deeply satisfying smell at a moment when you are vulnerable to another in the hairdressers definitely improves communications between stylist and customer. It is like eating and sharing something terrific like good food! There’s no doubt; aromatic essential oils stimulate overriding feelings of wellbeing and health that can’t really be described here. Smells are emotive and we have been surprised by how much we love So Pure and enjoy using the product range in our everyday work. It’s so light and gentle on the skin and we’ve realised in the change how important that is to our hands too. What we know for sure is that the natural aromatics of So Pure have changed the dynamics of having a shampoo or other service at the basin. It’s because this range smells so good that everyone feels more relaxed. One and all enjoy it now when a customer is being shampooed – or when the So Pure Moulding Wax or amazing Argon oil is being applied. Many times, since bringing in this range, I’ve thought about the book ‘Perfume’ by Patrick Suskind and the effect the story had on me. That’s because it was the first time I understood the irresistible power of perfume. I like the quote above, and I hope the blog inspires you to try our new range! P.s., Pop in and look, or try a luxury moisturising treatment. We offer a junior stylist cut and finish for £25! Gill knows that I don’t like product in my hair. In fact, it took me several years to move to moose to style and finish (and then only for special occasions). My hair loses its life so easily. And synthetic products do this the quickest in my case. 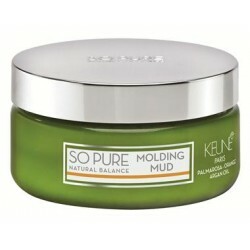 So when Gill showed me the Moulding Mud from Keune So Pure range my eyes narrowed. I looked in the mirror at another fabulous cut from Gill, and a colour from Hanna, and said – ‘oh go on then’. The products from Keune smell so good, and the cut so neat that what could possibly go wrong? Gill had told me about So Pure and I knew this was one of the most natural professional hair care ranges in the business. This is the first hair styling product I have used that is in fact neither waxy, synthetic or drippy! 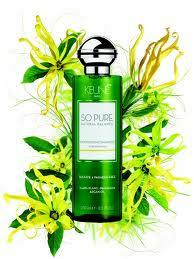 So next time I am in I will be picking up more of these Keune So Pure deliciousnesses. A quite hair-yummy range. And my aversion to product is, well, disappearing in a burst of orange-scented mud!